Stains build up quickly on toilets that have hard water supplies. Frequent cleaning can help minimize the staining but cleaning with harsh cleaners can scratch the surface and invite more discoloration. Rust and lime are common residues found in the commode. 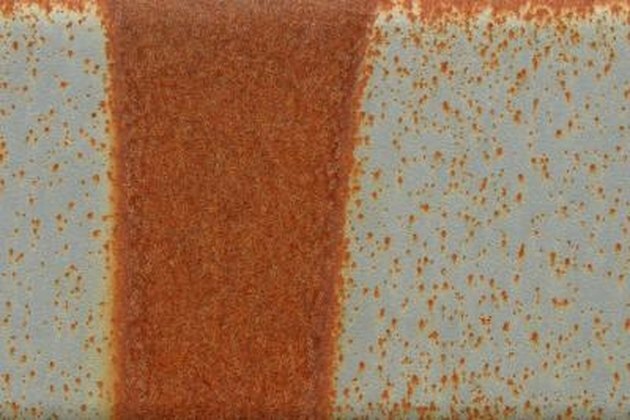 Rust is from iron in the water and lime is from deposits of minerals found in the water that build up as lime scale. Products, such as rust and lime removers are available to help these problems, but you can also use common household items and science. Acids neutralize alkaline soils such as rust and lime. Do not use bleach on rust because it will set the stain. Rust stains can't be removed with regular toilet cleaners. Put on the gloves and eye protection before proceeding with cleaning. If you use a tank cleaner, remove it and flush until the bleach is gone. Turn off the water at the back of the tank and flush until the water is gone from the bowl. Use the plunger to remove the last of the water. Fill a bucket up with water and keep the rag handy in case of spills. Pour hydrochloric or oxalic acid on the toilet brush and scrub the bowl. Scrub under the rim too. Try to scrub slowly so you do not make a lot of spatters. Hydrochloric acid is caustic. Clean any spills or splashes up immediately with water and the rag. Turn on the water and flush several times. The rust should be gone. Make a paste of borax and lemon juice and use the toilet scrubber to remove the rust stains. This is less toxic and more environmentally friendly but will take a lot more physical effort. Apply the paste to a dry toilet, scrub until the stain is gone and then flush to rinse. Pour 1 cup of distilled vinegar into the toilet bowl and scrub with the brush to remove any lime scale. The majority of the scale will be concentrated in the reservoir, so pour a cup of vinegar into that and let it sit for an hour. Flush the toilet as usual to rinse out the minerals. Vinegar contains acetic acid and is a good way to melt away the lime. Pour 1 tsp. of granulated bath bubbles into the toilet water. It contains surfactants that are affective at removing mineral and hard water stains. Scrub the soap around onto the bowl surfaces and then flush to rinse. Sprinkle 4 tbsp. of trisodium phosphate into the toilet bowl. Swish it around on all the surfaces and then scrub with the brush. Let it sit in the toilet for five minutes and then flush to remove the lime scale. What Are the Active Ingredients in Toilet Cleaners?